Far reaching in its social as well as its economic impact, the income tax amendment became part of the Constitution by a curious series of events culminating in a bit of political maneuvering that went awry. The financial requirements of the Civil War prompted the first American Income Tax in 1861. At first, Congress placed a flat 3-percent tax on all incomes over $800 and later modified this principal to include a graduated tax. Congress repealed the income tax in 1872, but the concept did not disappear. After the Civil War, the growing industrial and financial markets of the Eastern United States generally prospered. But the farmers of the South and West suffered from low prices for their farm products, while they were forced to pay high prices for manufactured goods. Throughout the 1860?s, 1870?s, and 1880?s, farmers formed such political organizations as the Grange, the Greenback party, the National Farmers Alliance, and the People's (Populist) Party. All these groups advocated many reforms considered radical for the times, including a graduated income tax. In 1894, as part of a high tariff bill, Congress enacted a 2-percent tax on income over $4,000. The tax was almost immediately struck down by a five-to-four decision of the Supreme Court, even though the Court has upheld the constitutionality of the Civil War Tax as recently as 1881. Although farm organizations denounced the Court's decision as a prime example of the alliance of government and business against the farmer, a general return of prosperity around the turn of the Century soften the demand for reform. Democratic Party Platforms under the leadership of three-time Presidential candidate William Jennings Bryant, however, consistently included an income tax plank, and the progressive wing of the Republican Party also espoused the concept. In 1909 progressives in Congress again attached a provision for an income tax to a tariff bill. Conservative, hoping to kill the idea for good, proposed a constitutional amendment enacting such a tax; they believed an amendment would never receive ratification by three-fourths of the states. 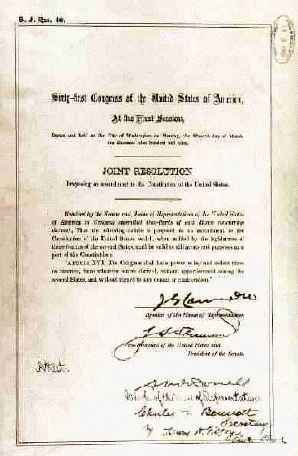 Much to their surprise, the amendment was ratified by one state legislature after another, and on February 25, 1913, with the certification by Secretary of State Philander C. Knox, the 16th amendment took effect. Yet in 1913, due to generous exemptions and deductions, less than 1 percent of the population paid income taxes at a rate of only 1% of net income. The full potential of the income tax for revenue and for the redistribution of wealth was realized for the first time during the New Deal. 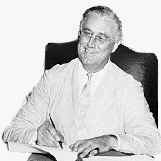 President Franklin D. Roosevelt declared our revenue laws have operated in many ways to the unfair advantage of the few, and have done little to prevent an unjust concentration of wealth and economic power. The Revenue act of 1935 popularly called the Wealth Tax Act, went a long way toward remedying the evils described. It provided steeply graduated personal income taxes up to 75% on income in excess of $5 million. Wealthy Americans deplored the leveling effect of a graduated income tax and called President Roosevelt a ?traitor to his own class.? Almost immediately, income tax evasion became an important area of criminal activity. The income tax did not directly affect most Americans until World War II: In 1939 only 5 percent of Americans paid federal income taxes. But the Revenue act of 1942 raised tax rates, lowered exemptions, and created the Victory Tax of 5 percent on incomes over $624, broadening the income tax base considerably. The new payroll withholding tax was the greatest change for the majority of Americans. The "Pay-As-You-Go" tax plan, developed by Beardsley Ruml, the treasurer of the R. H. Macy department store, was adopted in the Current Tax Payment Act of 1943. The result of the new tax plan was that over 74 percent of Americans were paying federal income taxes by 1945. NATIONAL ARCHIVES: National Archives and Records Administration - documents the rights of American citizens, the actions of federal officials, and the national experience. Can a person receive a tax refund if they are currently in a payment plan for prior year's federal taxes? Is there an age limit on claiming my children as dependents? What is the American Recovery and Reinvestment Act (ARRA) of 2009? How much does a student have to make before he or she has to file an income tax return? If I claim my daughter as a dependent because she is a full-time college student, can she claim herself as a dependent when she files her return? Tax Trails is an interactive session which poses questions that you can answer by selection Yes or No. A 1040PC is a paper tax return prepared on a computer using the approved IRS tax preparation software. Taxpayers mail the form (return) to the IRS and the IRS can directly deposit refunds into savings and checking accounts. It's that simple. Jane makes a ton of money each year, and flies (on her private jet) to and from her houses in Miami and New York. Tough life. John earns a more modest salary and rents a small apartment. Jane and John do NOT pay the same amount in taxes. Their ability to pay differs vastly. John pays less, for his amount of income (wages, interests, profits) and assets (houses, cars, stocks, savings accounts) is less than Jane's. A person's entire income reduced by adjustments including a deduction for an IRA (Individual Retirement Account), medical savings accounts, and alimony paid to an ex-spouse. Note to the wise: Saving money now in an IRA for your retirement (yes, even though it seems like a million years away) could be one of your smartest moves yet. When people pay taxes according to the amount of government aid (benefits) they receive. Examples of benefits the American public receives include (to name only a few): welfare, child care, Medicare, Medicaid. Some people believe it's only fair that people pay taxes based on the amount of government aid they receive. Are you a budding entrepreneur? Just remember that businesses pay taxes to federal, state and local governments. Businesses pay taxes on their profits. Businesses also pay unemployment insurance, worker's compensation, social security and Medicare insurance. If you have a store credit, you can use the credit to purchase merchandise free of charge. If you have a tax credit, your taxes are reduced by the amount of your credit. You can get tax credits for purposes such as child care expenses and the earned income credit for low-income taxpayers. A person who relies on someone else for financial support. Sound like a mooch? Not really. Think about it- most "young adults" (under 21 years old) are supported by their parents. Is this you? If it is, your parents can claim an exemption for you-their adorable dependent-if dependency tests are met. When you give the IRS the go-ahead, they'll send your refund directly to your bank account. It's the fastest way to get your cash. A direct tax cannot be shifted to others (unlike an indirect tax). A good example of a direct tax is the Federal income tax. You just gotta pay it. Are you a stockholder? If you are, you receive dividends, or a portion of a company's earnings and profits. In simple English: All the money you earn. This includes any wages, salaries, tips, net earnings (if you're self-employed), and any other income received for personal services. Add it all up, it's all earned income. Not exactly rolling in dough? Low-income workers can file a tax return to get an earned income credit, even if no income tax was withheld from the worker's pay. It pays to be computer savvy! Taxpayers can now file their tax information with personal computers and tax preparation software. The information goes directly to the IRS and the IRS can directly deposit refunds into the taxpayer's bank account. Electronic filing allows taxpayers to get their refunds quickly. Check out IRS e-file. Excise taxes are taxes on the sale or use of certain products or transactions. So every time you make a telephone call, buy a plane ticket, or ride in a car (to name but a few) you'll be paying excise taxes. Have you ever been exempt from taking an exam because your average was high enough? What a feeling! Well, taxpayers can be exempt from paying a certain amount of federal income tax if they meet certain income, tax liability, and dependency requirements. In fact, you could be exempt from having certain taxes taken out of your paycheck. If you have a job, be smart and check into this. Before a taxpayer pays taxes, he/she can claim a set amount of tax deductions for him/herself, a spouse and eligible dependents. The total amount is subtracted from the adjusted gross income. Then the tax on the remaining income is figured out. The Federal Insurance Contributions Act (FICA) consists of both a Social Security (retirement) payroll tax and a Medicare (hospital insurance) tax. The tax is levied on employers, employees, and certain self-employed individuals. EINs are used to identify the tax accounts of businesses. You need to get an EIN if you have employees or operate your business as a partnership or corporation. An EIN is also needed if you have a Keogh retirement plan or file certain tax returns. Form SS-4, An Application for Employers Identification Number, is used to request an EIN. Cutting edge! Certain states allow taxpayers to file tax information for both federal and state income tax returns with home computers and tax preparation software. To file a return is to send in your completed tax forms, or return ("return" is the official term-use it, you'll sound smarter). All your tax information appears on the return, including income and tax liability. Your filing status determines your tax bracket and amount of taxes you must pay. Factors such as marital status affect your filing status. This form is great if you're single or married, don't have any dependents and aren't rolling in dough. If your income is $50,000 or less and your interest income is $400 or less --- use this easy (get it, EZ) IRS form to file your return. By January 31 of each year --- your employer (even if you don't work there anymore) will provide you with a statement of how much you earned in wages, tips and other compensation from the previous year. This form will reflect state and federal taxes, social security, Medicare wages, and tips withheld. It also includes a lot of other really important information you will need to file your return. If you have or had a part-time or summer job, you probably completed this form on your first day of work. This form determines how much of your paycheck is withheld for federal income taxes. There are strict steps (that involve the President and Congress) that a proposed tax must pass through before it becomes a law. This deals with all the money, goods and property you receive that must be included as taxable income. Fact: people who use the barter system (exchanging non-monetary goods/services as payment) have to include whatever they've bartered for as part of their gross income. Horizontal equity says that people in the same income groups should be taxed at the same rate. "Equals should be taxed equally." These are taxes on income, both earned income (salaries, wages, tips, commissions) and unearned income (interest from savings accounts, dividends if you hold stock). Individuals and businesses are subject to income taxes. You might not think you're paying this tax, but you probably are. It's the type of tax that can be shifted to others: hence the name. For example: A company might have to pay a specific tax to the government, let's say a fuel tax. The company pays the tax but can increase the cost of their products so consumers are actually paying the tax indirectly by paying more for the company's products. Ever joined a book club? What about a study group? Well, if you're interested, there are also informal tax legislation meetings where individuals and interest groups get together to discuss tax issues. Once you become a steady wage earner, these are meetings you probably won't want to miss. You deposit your money into a savings account for a reason, right? So you can earn interest on your money. People also earn interest from lending money to people. We're not talking about you lending your buddy Dave a couple bucks to buy lunch, we're talking about lending lots of money so the interest really accumulates on the loan. Well, add up all that interest you accumulate and there's your interest income. Not to burst your bubble, but that interest income is all fully taxable. In addition to federal and state taxes, your local town or city may also need tax money to operate services such as garbage pick-up, water treatment, and street-cleaning. The Medicare program funds the federal health program for people over 65. It helps out people at a time in their lives when they may have health problems but may not have a lot of money. Your employer deducts a certain amount from your paycheck to pay for taxes. This tax money funds many finance specific programs, including social security, health care and worker's disability. These programs might not mean a whole lot to you now, but you may likely benefit from them when you're older. Check out It's Payday! Everyone pays a tax on his/her yearly total amount of taxable income. Remember that the personal income tax is not a tax on the taxpayers total income (the taxpayer can take deductions). Deductions are subtracted first from the taxpayer's income and then he/she pays the tax on the remaining amount. This type of tax takes a larger percentage of income from higher income groups than from low-income groups. Is this fair? Check out What is Fair? It's likely you've landed on "property tax" when playing Monopoly. In real life, people pay taxes on property, including real estate, boats, cars, recreational vehicles, and business inventories. Something to think about before you buy that new car. Check out What is Fair? Proportional taxes take the same percentage of income from everyone regardless of how much (or little) a person earns. This type of tax is not currently in use, but some feel it's the way to go. What do you think? Check out What is Fair? Do you attend a public school? Ever wonder who pays for your education? Taxpayers! Tax money is used for a variety of public goods and services-all available for use by the public (that includes you and your friends). Some examples of public goods are national defense, street lights, and roads and highways. Public services include welfare programs, sanitation, law enforcement, and education. The government can designate an area as a redevelopment or enterprise zone, meaning that the area is in desperate need of some serious improvements. No, your room probably wouldn't make the cut-you'll have to do that restoration on your own. A neighborhood in complete disarray (burned out buildings, broken sidewalks, potholes in the street, etc. ), on the other hand, could qualify as such an area and taxpayer money could help fund the restoration process. When your employer deducts too much money from your paycheck, the government owes you that money back. When they pay it, it's called a refund. This is the tax that takes a smaller percentage from those with high income than from those with lower income. Is this fair? What do you think? You gotta have that new CD, but do you have enough cash? Don't forget to add the sales tax to the price. Depending on the state you live in, you pay an extra percentage of sales tax for items purchased. Your class schedule essentially organizes your day, right? Taxpayers have to be organized too. They use certain schedules (or forms) to itemize specific sources of income or specific expenses they claim should be deducted from their taxes. It can pay to be organized! Social Security is America's government-run retirement plan. One day, when you're your grandparents' age, you'll get the money back. Some taxpayers choose to take a standard amount instead of itemizing all of their deductions. This is a fixed amount that is generally based on a person's filing status. There are all kinds of taxes which are used to pay for all sorts of things. Some of our money goes to the Federal government, which pays for services like Interstate highways, the armed forces, the FBI, and a lot more. Your state also needs money for schools, roads, state troopers-to name just a few. At the end of the tax year, you will need to send one form to the Federal government, and another to your state government. Ever travel abroad and do a little duty-free shopping at the airport? You're buying tax-free products. When you buy that same product at your corner store (assuming it's not a duty-free shop), you're paying a tariff duty or tax on the product. The amount of money that tax payers can deduct directly from their taxes. The amount that a person or business can subtract from their taxable income. The more you can deduct, the less you pay. Pretty excited when you're exempt from gym class? Taxpayers are pretty happy when they see there's a part of their total income on which no tax is imposed. That's a tax exemption. There's no getting out of it- tax liability is the total amount of tax that a person must pay. Taxpayers pay this through withholdings, estimated tax payments, and payments attached to their yearly tax forms. This is software created specifically with the IRS in mind. It's designed to help you prepare your taxes on a computer. The software works with the e-filing system to let you file quickly and accurately. Check the Digital Daily for software recommended by the IRS. One lucky person or group is able to shift a tax that they're supposed to pay to someone else. There's a portion that your employer takes from your (and other employees) paycheck to pay part or all of your taxes. Check out It's Payday! Taxes are required payments of money to the government. This money is used to make your life better. You might not even realize it, but tax money provides public goods and services for the community as a whole (think roads, schools, law enforcement, public libraries, etc.). Show a little gratitude, pay your fair share. Here's a tip on receiving tips: If you earn more than $20 a month in tips, you must report the amount to your employer. To keep track of your tips keep a daily "tips-earned log" where you write down the exact amount of tips you earn each day. Share the monthly total with your employer who will make certain federal, state, and local taxes are paid. Remember, it still pays to be nice . . . so don't forget to smile. Check out It's Payday! The sale of all goods and services have transaction taxes. These taxes can be a set percentage of a sales value or a set amount of a physical quantity. What's that all about? Let's say you buy a CD-you pay a set amount in sales tax, but when you fill up your tank with gas, you pay a tax per gallon. Who said all taxpayers are created equal? Vertical equity states that people in different income groups should pay different rates of taxes. Our current tax system is one of vertical equity. Your mom might order you to clean up your room. Well, the IRS doesn't have time to tell every single taxpayer to file taxes correctly and on time . . . there are millions of taxpayers in this country after all. This system relies on citizens to report their income, calculate tax liability and file tax returns on time. Everyone's gotta grow up sometime. Check out It's Payday! If you need help preparing your taxes visit the Voluntary Income Tax Assistance (VITA) office nearest you. Many VITA offices have IRS representatives who can help you fill out your forms and then transmit the information on your forms electronically. Your employer takes out a certain amount from your check for the government. You are credited for these taxes when you file your return. This money is used to pay for your federal income taxes, federal social security, and Medicare taxes, and state and local income taxes. Check out It's Payday! When you fill out the Form W-4 your employer can figure out the total amount in taxes to deduct from your paycheck. Your withholding allowance is the total number of allowances, or exemptions you claim. The employer also uses your total amount of income earned and marital status to figure out these allowances and exactly how much income tax to withhold from wages. Most of the verbiage, pictures, links, and materials used in this site were produced by Federal agencies and fall into the public domain and may be reproduced without permission. We have been careful to give credit to each federal agency with an appropriate link. For more information on use of government information click here. Start your search on Federal Tax Return.